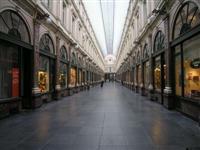 Mall lovers everywhere should make a pilgrimage to the Galeries Royales Saint Hubert, the very first shopping arcade in Europe. Opened in 1847, the arcade became a drawcard for the elite of 19th century society and today continues to inspire shoppers and browsers alike. People from across the globe, young and old, enjoy perusing here and everyone will find something to their taste. The building is an architectural marvel: arcaded shop fronts across two floors are separated by pilasters, conceived in a Cinquecento style. The roof above is made of arched glass panes, connected by a delicate cast-iron framework. In between the various shops you'll find cafes, restaurants, a theatre, and even a cinema. With so much to see and do here, this attraction is family friendly and one the kids will enjoy too. Opening times: Varied times depending on stores. Check website for details.